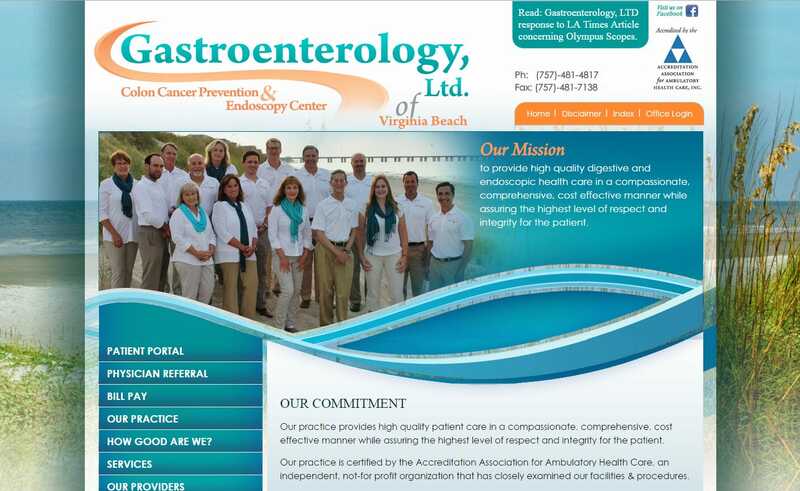 Website design for Gastroenterology Practice | This is custom designed mobile responsive website design using rich textures and colors to convey the look and feel of the Virginia Beach, Hampton Roads region. The website features a unique left-side accordion navigation. At VISIONEFX there are no plug-in-play Word Press templates unless a client indicates this is their choice. We feel every website should reflect the look, feel, style and branding of the online business. This is the 2nd website redesign for Gastroenterology LTD. since becoming a VISIONEFX client many years ago. We provide the finest in website design for medical businesses, website design for doctor offices, and website design for healthcare providers. When searching Web site design Virginia Beach, Tidewater VA look no further than the web design experts at VISIONEFX.